One of my favourite fall activities is carving pumpkins and then roasting the pumpkin seeds. I think you may fall in love with this recipe (pun totally intended). These make a great snack on their own, or to sprinkle on overnight oats or granola. Not only are pumpkin seeds packed with magnesium, manganese, copper, protein and zinc, but they also have amazing health benefits specifically beneficial for women with PCOS (read more below in ‘PCOS Powers’). What are you waiting for? Get carving, cooking and snacking! 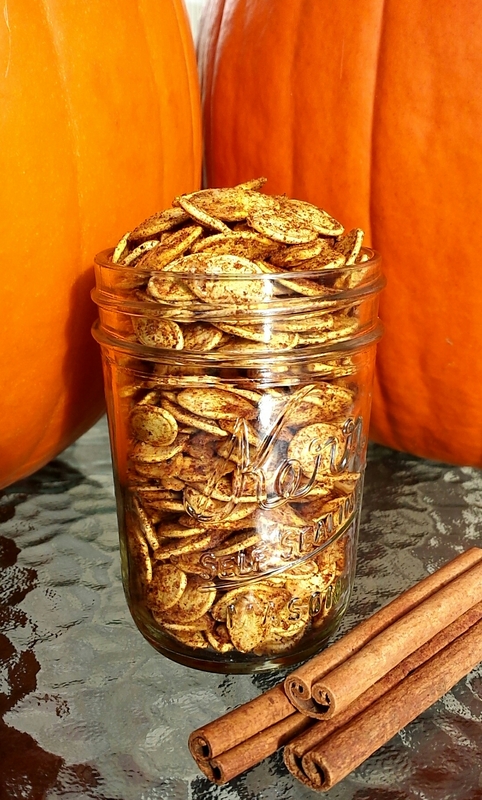 Scoop out pumpkin seeds along with the inside of the pumpkin. Separate pumpkin seeds from pumpkin goop (technical word, I know) and rinse clean. Spread seeds out on baking pans, pat dry with paper towel, and leave out overnight to dry. Preheat oven to 200 deg. F (very low). Mix spices and oil together in a small bowl. Pour over seeds in a large bowl and mix to coat seeds. Spread out seeds in one layer on parchment paper on a baking sheet. Cook at 200 deg. F for about 45 min. What an interesting spin to my favorite fall treat! I can’t wait to try this! Pinned to my “Holiday, Celebrate!” board. Wonderful! Please let me know if you end up trying them out! My daughter and I love munching pumpkin seeds! I usually just add some salt, have to try your recipe! Those spices would make them even more delicious! Thanks for sharing! Yay! One more way to get turmeric into my diet! Great idea.